We are into the home stretch. Get chatting about your squad. 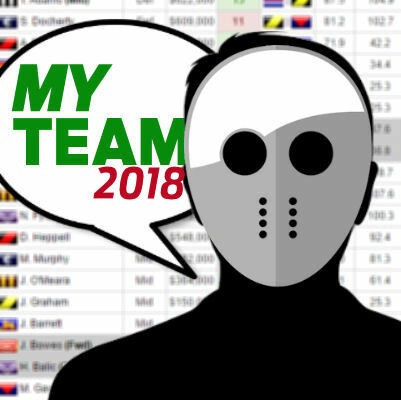 The final week of the JLT is here and so is a new My Team. Version 3 is running through the JLT Series… so get your chatter happening as the games play out. Post your team (in an easy to read format) and discuss where it’s at in the comments below. Now that we have My Team cranking, discuss any players, team structure, etc in the comments. As always, keep it civil and if you’re advice, make sure you dish out some of your own (make sure it well thought out and not blatant trolling – we’re totally over that after 10+ years of DT Talk!). Get keen for a massive season ahead. Has anyone watched fremantle over the pre-season. How is walters as an option, looks as if he is playing in the midfield this year? Hey boys my son has made his first team. I helped him with his rookies but he picked the rest himself. What do you guys think? Keep in mind he is only 10 & he does not care about byes. Rocky and Wines are probably too many Port players given their bye. Also, who is Sidney? Did you mean Sidey? Rest of the team looks solid. I would try to get Danger to Titch if you have the money. Wow!! Great job matey. Cant fault i. Maybe Titch? If your son ever wants a change from school, he can manage my SMSF for a while. Don’t worry about the Sidey thing. Juan Antonio Samaranch had a similar probrem way back when. Sicily and Rayner or Brayshaw and Christensen? Draft Sunday arvo 4pm ADEL time. thoughts on having walters bell and hutchings as F3-5. Cant trust these FWD rooks? Only got 34 JLT2. A lot have jumped off because of that. At the higher end of price for a rookie as well. But you’re right, Carlton will play him. is he a pure midfielder this year, or is he part of rotation between the forward pocket and midfield? I think he will always have stints forward as hes so dangerous around goal but going off JLT he will have plenty of time in the midfield. Going to be too inconsistent for me though. What do we see Savage averaging this year? Cheers! If he continues his JLT form he could average 90 but the last 3 seasons he has averaged 81(12 games), 75 (21 games)& 69(20 games), so I think even a prediction of 85 average could be overs. Imo hes an 80-85 avg player these days. All you can hope for is that he has a killer start and you trade him when he peaks in price. Think theres much more value in JOM. is jelwood an option as a POD with value? Is LDU being overlooked because of the JLT? The kid is an absolute beast, clear best player of this years draft IMO and will play as a full time mid for North. I can only fit one high end expencive rook so ive opted for brayshaw over LDU and Dow. I’m also running Kelly on field as hes a bit cheaper and is mature age, should score higher earlier in the season imo. I am running LDU in supercoach on my bench though. Is hutchings a viable option? only 1.5 % ownership and is touted for an attacking midfielder role instead of his usual run-with role. Got 70 odd points from about 40% game time in JLT 1 and a respectable 74 from 77 in JLT 2. Looks like a way better option than Christensen at the moment who is in everyones team and is playing asa a forward in Lions team that might struggle to get it in there. Hutchings still too risky for me. Christensen a 70’s player!? Madness! 2016 he had an injury effected year but years before hes averaged 83, 82, 84. The 83 was his first year at Brisbane. He’s had a full preseason and is a no brainer at his price.. His JLT 2 score was in a torrential downpour, so discount that game. Interestingly, hes decreased his average every year since his debut year in 2013, in which he averaged 91 from 6 games. IF he can improve to show the promise of his first year, and average 90+, youll have a money maker and a keeper. But with the eagles having such an unpredictable midfield and his reputation as a tagger, and his elevated price, it may be safer to go with an expensive fwd rookie instead, as ge could just as likely average 70, make less money than a rookie and need to be traded. One to pick if you want to take a punt for sure. yea i agree, i think im going to take the punt and he is going to play f5 for me. yea f5, really risky but at the end of the day im not just gonna go in with a vanilla team. I just cant trust these FWD rokks, at the end of the day, i dont see any fwd rooks capable of averaging 70.
ive got hutchings, tom bell, michael walters and Sic Dawg ATM. Mid-price madness/ JLT reactionary :D I reckon steven is a fallen premium more than a mid-pricer. and devon smith can be considered a premium as well, i wne twith walters to be a bit unique, not sure tho if i will stick with it. Hutchins is known for tagging. This team seem right structure wise or any players who seem too weak for their spot? Advice plz , quite happy but not sure whether to downgrade beams or Neale to dow to get a safer fwd line as have no confidence in rooks. Is the pig 🐷 a risk? No JLT games? Can someone have a look at this and let me know what you reckon? Thoughts on Callum Sinclair at R2? Chat about your team in the countdown to lockout.